You raise some important issues here. Although we have OWL ontologies to accompany our data I think they are probably just as impenetrable as the data. It’s a tricky balance between putting too much and too little information in there. One thing that is in the linked data improvement plan at OS is better documentation and possibly simple UMLesque diagrams. Would that be useful to you? What sort of things could we do to the OS site to make your linked data experience a more pleasant one? This is one reason I try to blog stuff as quickly as possible when I’m struggling with something… in retrospect, things may seem obvious, but by logging my own learning journey it can act as a useful reference for creating teaching/learning materials in the future, as well as leaving a learning trail for others who are similarly struggling at the current time! I agree Tony. It completely discourages the open data hacker/tinkerer. When I want to match some data, I want to get onto exploring the data quickly. I don’t have the time to spend cleaning the data or finding the identifiers. I’d say that about 80% of times I see some open data, and think of a really exciting way of mixing it with other data, I don’t bother because the IDs are wrong/missing. though maybe more detail would be useful? The challenge with demos is that one-size-doesn’t-fit-all. If all datasets had proper IDs, then we could demos in any of our favoured tools, be they Tableau, MySQL, R, Yahoo Pipes, or whatever. 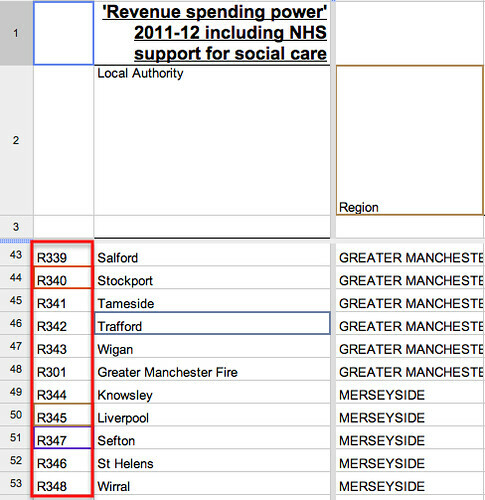 However, how could you ever demo linking the council data that this post started off with? You would need to know how to search for potential ID lists. You’d need to know where to search for them. You’d need pretty advanced skills in Excel or a database technology. Most of the skills required to match this kind of data can only be learnt by experience. I can’t see how you could encapsulate that kind of thing in a step-by-step demo. All very chicken and egg isn’t it. The LD web feels like the web did before we had any tools or decent search engines. You need to get some data out there in order to build stuff, but it’s hard to build stuff without the tools. But then people like you experimenting inform developers as to what kinds of tools/services are needed to make it easy. I certainly agree with the need to make the models clear, choose simple models where possible, support them with documentation and examples. Also to use things like the Linked Data API and visualizations over it to make it possible to explore and query lilnked-data and grok the model, without having to learn SPARQL. The post is mis-titled. Isn’t the first part of your story a great example of where linked data would help? You have a spreadsheet which uses internal codes which no one else seems to use. If instead it had been published as linked data, or if someone else out there understands R* codes and can republish as linked data, reusing council URIs then it seems to me that would be a great help for what you are trying to do. I’ve got a password protected page where I want to display a list of people attending a meeting. The list is in the google spreadsheet and my intention is to export in CSV format and display it in a text widget. I want to show Name and Company and then the details below. Previous Previous post: So You Want to be a Data Scientist…?